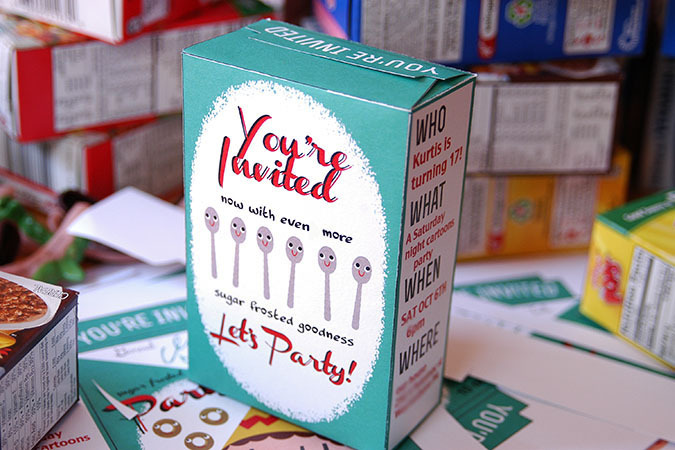 I finished all the invitations for Kurt’s 17th birthday celebration. As I said before he is having a Saturday Night Cartoon & Cereal party for his birthday. 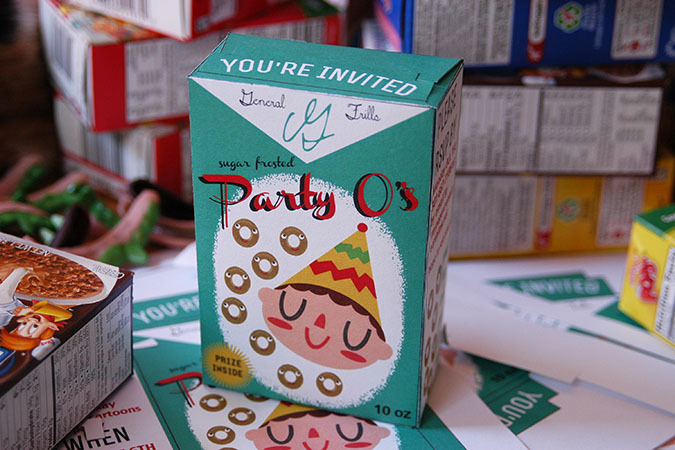 Mini cereal box invitations just seemed the most logical choice. I created a pdf file so you can make them for your parties too. 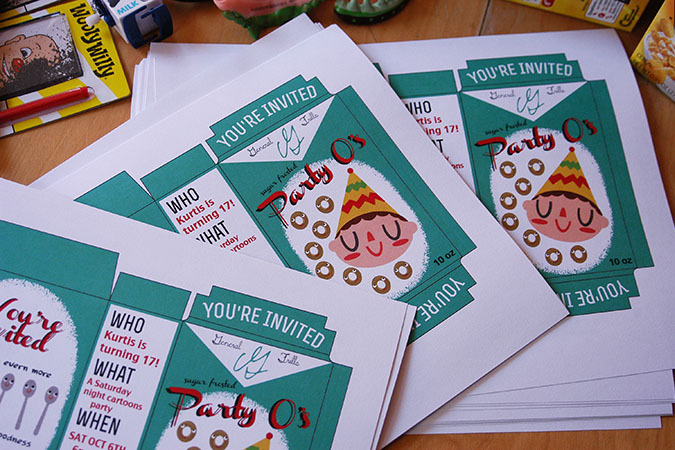 You can either write in the info, or use a program like photoshop to insert the info of your party into the invites. Please remember this pdf is for personal use only and should not ever be sold. You can find even more of my digital/printable goodies over at kitschy digitals. I had my pdf’s printed at Staples on card stock and cut them out with scissors. I did use a ruler and exacto knife to score all the folds, but they are pretty simple to make. I used a quick drying paper glue so they would dry rather quickly. 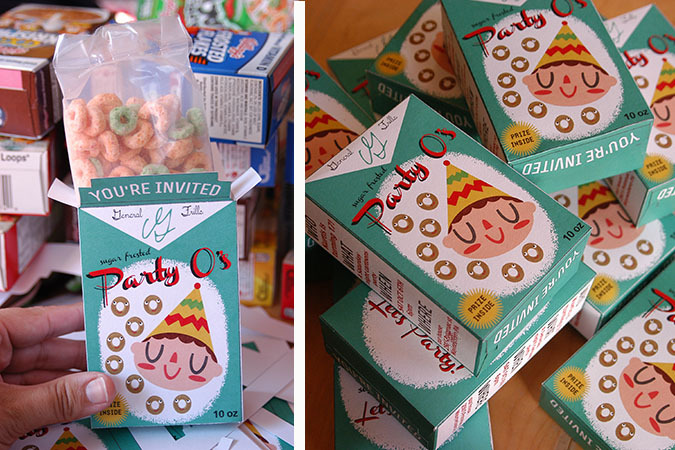 Once dry I opened up mini cereal boxes (you can get a 30 pack for $11) Of course the cereal is left in the sealed plastic bags they come in, but then you just slide it down inside the box. I added small toys to all of mine to make it even more fun. 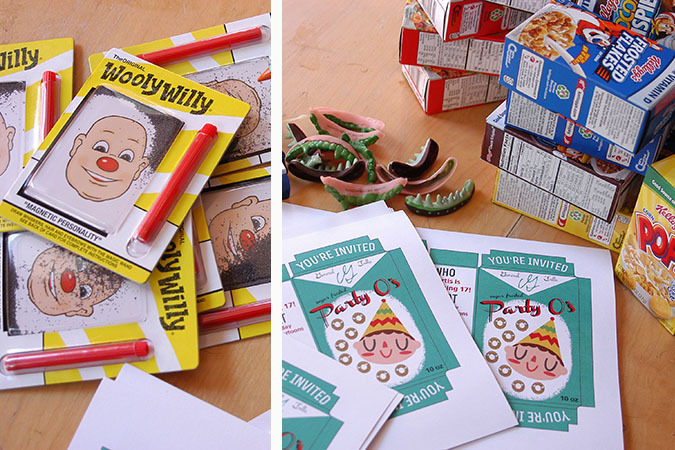 The boxes say “prize inside” so I picked up some cheap funny plastic teeth at Target (and those were slide in before the bag of cereal) And some mini wooly willies which worked the best because you just slide them down in beside the bag of cereal. Then I sealed the tops shut with glue. I’ll have even more details about the party as it gets closer. Tagged birthday, DIY, invitation, party. Bookmark the permalink. eeep! this is so amazing, heidi! your little ones (not so little ones!) are the luckiest to have you. and i only hope max wants a cartoon and cereal birthday when he’s turning 17. (did you mean to use your son’s name in this post? you usually put in a first initial; just a heads up in case you want to take it out) love reading your blog! these are SO CUTE! kurt seems awesome. that is the kind of party i would have loved to go to in high school! actually, that is the kind of party i would love to go to now! i can’t wait to see what else you guys do for it. such a good theme. Ahhh! I love them soooo much! Really adorable!